You all know how toxic chemicals are and your garden doesn’t benefit much from them. Even though the market has lots of these chemical-based products, they are not safe for your garden, and for the environment. Why don’t you try a natural solution instead? Vinegar is an amazing option that works just as well as chemicals, but instead of destroying our environment, it actually helps and it is completely safe to use. Dogs, cats, rodents, moles, and rabbits hate vinegar. So if your neighbor’s cat has a habit of coming into your garden, spray white vinegar around that area and you won’t see her again anywhere near your home. You can also soak old clothes in vinegar and hang it on stakes around your garden. After it rains, add more vinegar. Many gardeners say vinegar is the best organic insecticide. So, spray on affected areas and you won’t see ants ever again. Spray again after 2-3 days, and ants will be gone. Spray pure white vinegar on your walls or walkways to get rid of weeds. Your garden will look neat and amazing. To enjoy in your flowers longer than usual, add two tbsp of vinegar and 1 tbsp of sugar in a vase. Put the flowers in this solution and change it every couple of days. The solution works as food for the flowers. \Make a combination of 3 parts of water, 1 part of vinegar, and 1 tsp of dishwashing agent, and put it into a sprayer bottle. 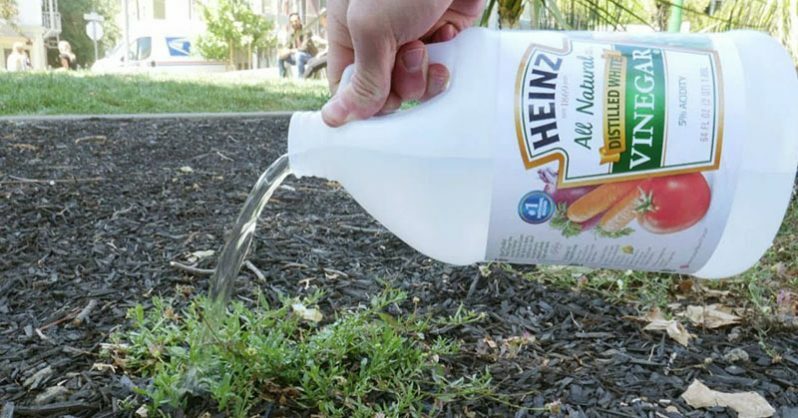 Shake it, and spray your garden with it. Rhododendrons, gardenias or azaleas will be happy if you use white vinegar. Add 1 cup of vinegar to a gallon of water, and water these plants. You will be amazed of their growth. Use undiluted vinegar on your tools. Spray them with the vinegar or just dip them in it for a few minutes. All you have to do next is rinse them well with water. If you notice your plants don’t grow well or there are some dark spots on their leaves, they probably have fungus or mold. Use white vinegar to get rid of this. Add 2 tbsp of vinegar to a brewed chamomile tea. Put it in a sprayer and spray your plants. You will see them become more vivid in no time. For roses, add three tbsp of cider vinegar to four liters of water. Spray them with this and get rid of the fungus. You should do this the night before you plant them. The first thing you will do is rub the seeds by using a coarse sandpaper. Then, make a solution using 500ml of warm water, 125 ml of vinegar and a squirt of washing-up liquid. Soak your seeds in it. The next day, plant your seeds and enjoy watching them grow.